Verizon is getting more aggressive about its promotions to attract new customers and keep existing ones happy with new offers that include free Netflix Premium and up to $20 in monthly discounts for Verizon Wireless customers choosing a double or triple play FiOS package. Verizon claims some of these offers are available to new and “qualified” existing customers until Apr. 3, 2019, and could deliver significant savings on plans that range in price from $39.99 to $79.99 a month. The budget minded broadband-only 100 Mbps plan offers a $50 Visa prepaid card and one year of service for $39.99 a month. 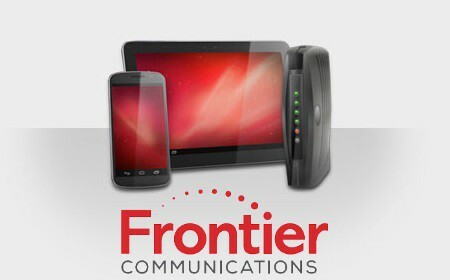 This plan is only available to new customers, does not include the $12/month router charge, or fees or taxes. Customers have to sign up for autopay using a checking account or debit card, choose paper-free billing, and pass a basic credit check. Those new or existing customers looking for faster internet-only service can choose the 300 Mbps plan for $20 more — $59.99 a month, pricelocked for two years. This plan includes six months of Netflix Premium, which supports Ultra High Definition (UHD/4K) streaming and allows up to four devices to stream at the same time. This is a $15.99/month value. These prices do not include the $12/month router charge, fees or taxes. If you want to avoid the router fee and get gigabit speed, pay $20 more ($79.99) and new and existing customers can lock in service for three years with no router rental fee (a $12/mo value) and one full year of Netflix Premium (a $15.99/mo value). Verizon also offers a triple play package to new customers including Custom TV, a slimmed down customizable TV package, with landline phone service and gigabit speed internet for two years at $79.99 a month, with one year of Netflix Premium (a $15.99/mo value). This plan has a two-year contract with a $350 early termination fee. There are a number of fine print fees to consider, however. Verizon charges a $12/mo fee for the set-top box, $12/mo router charge, $4.49/mo Broadcast TV surcharge and up to $7.89/mo Regional Sports Network surcharge. Also not included in the promotional price — a $0.99 “FDV Administrative Fee,” whatever that is. Altogether, these extra fees add $37.37 a month to the bill, turning the real price of this promotion into as much as $117.69 a month before other taxes and fees. Customers also have to sign up for autopay using a checking account or debit card, choose paper-free billing, and pass a basic credit check. Somewhat reducing the sting of surcharges and fees on the triple play offer noted above is a discount worth $20 a month if you are a Verizon Wireless customer with a qualifying Go Unlimited or Beyond Unlimited plan. 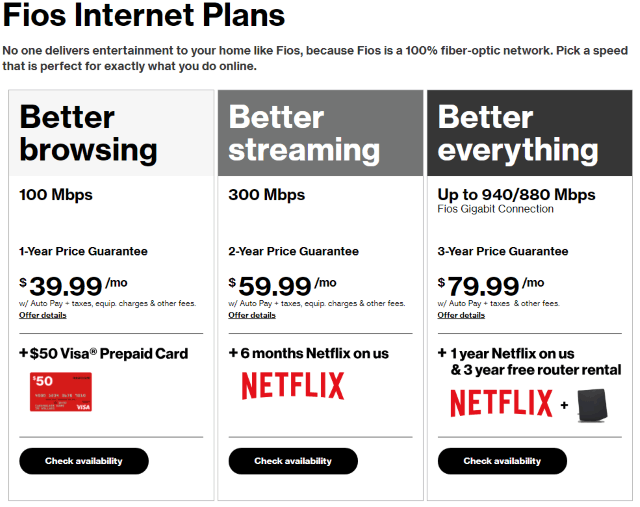 A bill credit of $10 a month will appear on your FiOS bill and another $10/mo credit will appear on your monthly Verizon Wireless bill as long as you maintain both qualifying FiOS and wireless plans.